The Vanishing Islands Of India's Sundarbans : Parallels Climate change has forced tens of thousands out. "I know I have a beautiful home," one islander says, "but ultimately it will go into the womb of the river. All we can do is try to delay the process." A boat approaches Ghoramara island in India's Sundarbans. 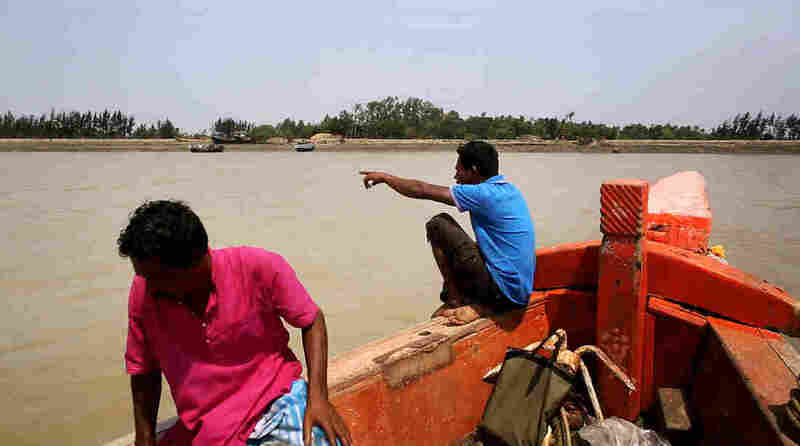 Most traffic goes the other way, as thousands of Ghoramara residents have left the flood-prone island in recent years. People in India know the Sundarbans as a beautiful and dangerous patchwork of mangrove islands covering nearly 4,000 square miles extending into Bangladesh. It is also home to a variety of rare and endangered species and a UNESCO World Heritage Site. Now, this watery landscape is getting international attention for a different reason. Some of these islands are disappearing, swallowed up by rising tides. Tens of thousands of people who live in the Sundarbans have lost their homes in recent decades. This is an estuary where saltwater from the Bay of Bengal mixes with freshwater from three of India's major rivers — the Ganges, the Meghna and the Brahmaputra. The tides in the Sundarbans are so dramatic that about a third of the land disappears and reappears every day. That's been happening for centuries. But just in the past few decades, the changes have become more extreme. In this delta, water levels are rising more dramatically than in other parts of the world — especially on the island of Ghoramara. Approaching the island, it looks like a piece of cheese where a mouse has been nibbling around the edges. There are trees in the center and mud flats on the perimeter, but chunks have been removed from the landscape. The mud bank has been heavily eroded by rising tides, which leave jagged tooth marks cutting into dirt and rock. Trees have toppled into the water. This island used to be home to 40,000 people. Today, just over 3,000 live here. 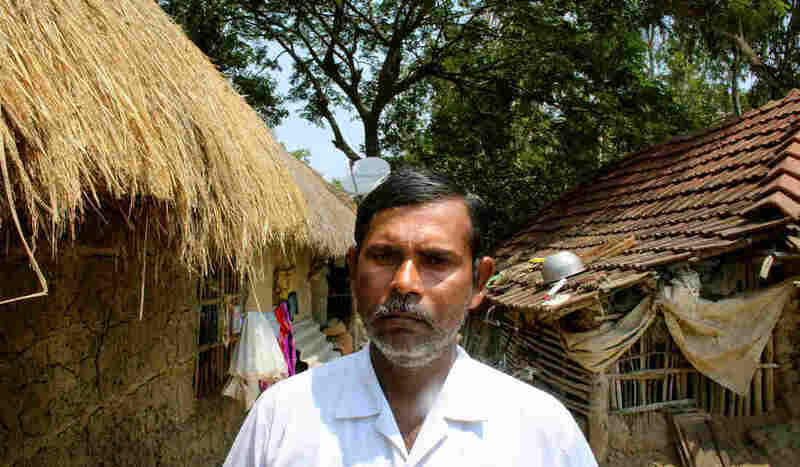 The first person we meet is 45-year-old Rubil Saha, who lives in a mud hut with his two children. Only a crumbling dirt embankment separates his house from the water. "Every year, my house gets inundated," he says. "Water from the river comes in and breaks the house. I rebuild it. And it's again destroyed." He shows us where the walls of his house are cracked and eroded. "This entire wall was broken," he says, "and I have built it again." Back when Saha was born on this island, the land was twice the size it is now, according to Sugata Haza from Jadavpur University in Kolkata, who has been studying satellite mapping data of the region. Saha's parents and relatives have all left. But he can't bring himself to go. His weeping seems to burst out of nowhere. "This is my motherland, so I can't abandon it," he says. "And the pull of the motherland roots me here. I am drowning in the river water, but I can't leave." Down the path, a boy named Sheikh Firoz comes out of his hut to greet us. He says he is 15 but looks younger. He has a cocky swagger, and a matter-of-fact attitude about life here. "Last time the flood came, I was asleep," he says. "My parents woke me up and we ran to the government school to take shelter. When we came back, the house was washed away." What did he think when they saw there was no house? "We just built this new house." It's midday — sweltering — at the center of the village. Children are splashing in a pond while women pump water out of a nearby well. Among all these mud huts, there is one concrete home, two stories tall. This is where the village leader, Arun Pramanik, lives. "I know I have a beautiful home," he says, "but ultimately it will go into the womb of the river. All we can do is try to delay the process." Pramanik used to think he'd have 20 or 30 more years here. But he says the floods have been coming so much more frequently, now he thinks it might not be long at all until everything is washed away. "We'll never have the same kind of community, the same kind of bonding we have here," he says. "Everybody will separate to new homes, new communities, new places." It's already started. One of those new places is nearby Sagar island. It's much bigger — a Hindu pilgrimage site, with power lines and paved roads. You can drive an hour and still not reach the opposite side. The village has only existed here for about 20 years, since people started being forced to leave Ghoramara. This is where the state government of West Bengal resettled them. Tens of thousands have been relocated over the years. "My father actually lived and died [on Ghoramara]," says Sushil Mali, now a grandfather himself. "The river didn't eat my father's house. Mali wasn't so lucky. He brought nothing to Sagar. "No. Nothing. All my things were gone." Ratan Maity moved here 15 years ago with his two kids. "I had no other option," he says. "The river was taking away our homes." He pieces together work pulling a cart and doing other odd jobs. He has never heard of melting polar icecaps or climate change. He's unaware that sea levels are rising around the world. All he knows is that his river in the eastern corner of India started devouring houses. "The river was angry," he says. "It took away so many things. It took people's lives. Children were swallowed. My home was gone. That's why I had to leave. We were scared." His new home is far inland. He can't go fishing anymore. But he feels safer. I ask if he's angry. "Sure, I'm angry," he says. "But what's the point? You can't defeat the water."